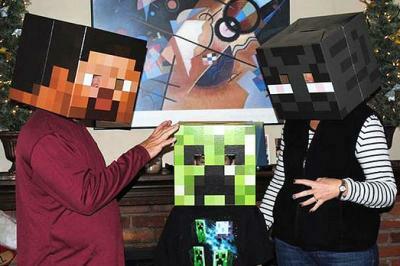 As one of the most popular video game titles among both children and adults, Minecraft provides several forms of costume inspiration. Whether you'd like to create a homemade costume or are looking for a purchased outfit to wear to your next cosplay event, there are plenty of options to consider. Thanks to the pixelated nature of Minecraft, you can easily turn a cardboard box into a mask representing your favorite character. This is the perfect project for kids, teens, and adults. 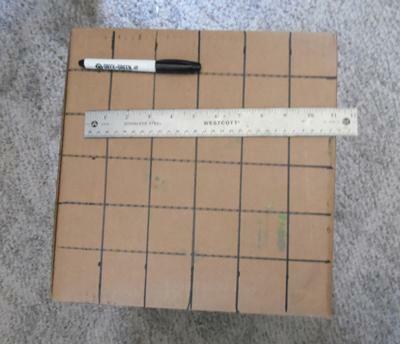 To begin, measure and mark an even grid on your box. 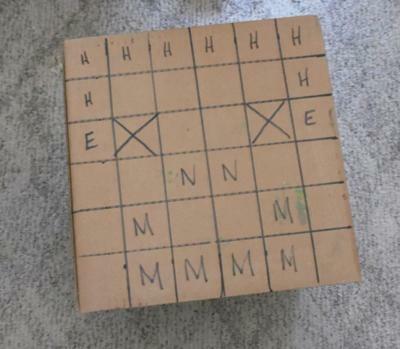 In this example, the box measures 12" x 12" and the squares are 2" x 2". You will need to measure and mark each of the four sides of the box separately. Next to the eye holes will be a square that will be painted solid white. Below the eyes will be two dark brown squares for the nose. Below the nose will be squares that indicate Steve's facial expression. You can make Steve smiling or give him a more neutral expression, depending upon your personal preference. In the photo, H=Hair, X=Eye Cut Area, E=Whites of Eyes, N=Nose, and M=Mouth. Use acrylic paint to paint the squares the appropriate colors. You may need more than one coat for full coverage. Try mixing colors together to maximize the pixelated effect of your mask. Once you've completed the front, fill in the top and back with various shades of brown for Steve's hair. On the left and right sides, you'll use shades of peach where Steve's cheeks and ears would be. Then, finish with brown on the remaining areas to complete his hairdo. Use your X-ACTO knife to cut out the eye holes. To finish the costume, pair the head with a plain light blue t-shirt, dark blue jeans, and gray shoes. With a few easy tweaks, make a Creeper and Enderman following the same general process as the Steve mask. 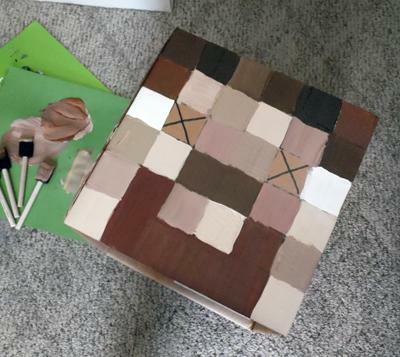 Make a Creeper costume by painting your box in various shades of green and making the facial expression black. To finish the costume, pair the head with a green sweatshirt and sweatpants or the green clothes of your choice. To turn your box into an Enderman mask, use black, dark gray, light purple, and dark purple to paint the squares on the grid. To finish the costume, pair the head with a black sweatshirt and sweatpants or the all-black outfit of your choice. If you're looking for a costume for someone who does not want to wear a mask, Minecraft inspired face paint might be a suitable alternative. This video explains how to create realistic looking Creeper face paint. When paired with a green sweatshirt and sweatpants or other green clothing, this is an inexpensive and comfortable costume choice. 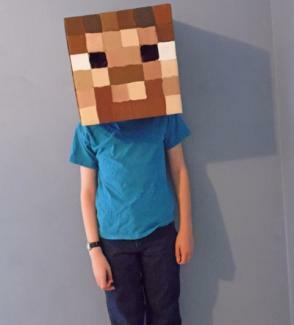 Just as with the cardboard masks, a similar technique can be used to create face paint versions of Steve, Enderman, and other Minecraft characters. If you'd rather purchase a costume, Amazon sells a set of Steve, Creeper, and Enderman masks. Rakuten also has a Steve mask that comes with diamond sword and pickaxe props. Alternatively, you may wish to consider a creative take on the basic Minecraft costume. For the young female Minecraft fan, the Etsy shop ForUWithLuv sells a tutu dress that is a feminine take on the Creeper costume. 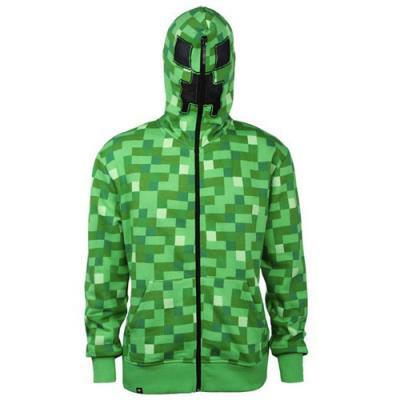 For an adult who wants to dress up without putting a lot of time into an elaborate costume, Hot Topic has a Creeper hoodie that zips up completely using mesh to create a realistic character mask. In addition, Halloween Costumes sells an adult size Ocelot costume hoodie. Dressing as a popular Minecraft character is an excellent way to show your appreciation for this award-winning video game title. Whether you choose to get creative and make your own costume or to purchase a complete Minecraft outfit, you're sure to be the envy of all your gamer friends. You may also inspire a few more people to come join the fun and start creating Minecraft worlds of their own!